Lurline's Place: Que Sera, Sera! Holding you and your beloved in the Light, my friend. And that quilt is GORGEOUS. Tell your DH that prayers are being sent from Utah. 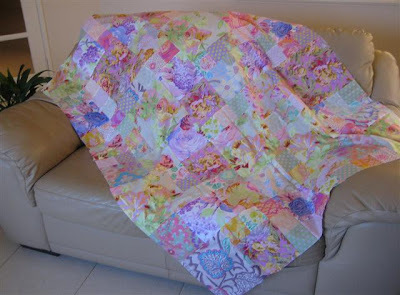 Your quilt is gorgeous - love all those wounderful colours! May you have peace in your heart through this trying time. You and yours are in my thoughts and prayers. Love the beautiful flimsy. And your grandbabies are wonderful! 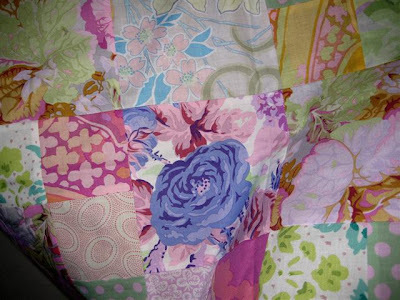 very pretty quilt, will be sending good thoughts your way as I always do! can't wait to hear the good news Lurline. Sorry that you and your husband are having such a ruff time, I hope you get the diagnosis soon and can be well on the mend. It is always hard to see someone you love go through physical problems. Those are such cuties...you are blessed. Sending good thoughts and wishes for you and your husband. The quilt is gorgeous, lovely colours! Sharon. Prayers and good thoughts are on their way to you! I like your positive attitude -- I think it helps! Love your quilt! So beautiful! Take it easy -- here's hoping for good news! dear Lurline, I wish you the best for you and your dear heart and lots of prayers. 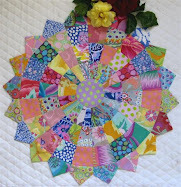 Your top is simply beautiful, what a fun quilt to do on retreat. Your right Lurline, our prayers and good wishes are with you and your dearest. I'm not usually a big fan of Kaffe (OMGoodness!) but you're turning me....those fabrics on your flimsy are just perfect! Lots of prayers and warm hugs to you both. I hope it's all good news. Your topper is beautiful. Very cheery and delicious! Praying all goes well and you will get great results! Love the Kaffe Lurline and hoping that it's good news for you both. Lurline I'll be praying for a very positive outcome to your specialist visits. 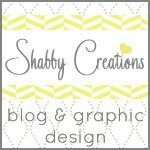 I'll cross fingers and toes and anything else I can think of!!! Your twinnies are just adorable!!! Happy birthday to them both :o)!! Lurline, lots of prayers and good thought going your way. Hope all goings well today. My thoughts are with you. Lot of good vibes sending your way. Happy birthday to the cute twins. Nice when children get on so well. Prayers are sent your way. Those six year olds are adorable!! Have been thinking of you and Ed...good thoughts and prayers. I hope all is well and a good outcome today.. The little ones are gorgeous...Happy Birthday Byron and Heidi.. So glad you got to go to the retreat..Catch up later..
Love the quilt, and your little ones are adorable. Keeping you and yours in my prayers for the outcome you're hoping for. Lovely quilt top. Your family will be in my prayers. Prayers and positive vibes coming your way, love the quilt and THRILLED to read you made it to your weekend retreat. Sending prayers and love your way. and those grandbabies are just to sweet. Hope good news will come your way regarding the test results Lurline. Lurline I will be thinking of you and Ed and hope you get good news. Cute kids. Hope your news is good news. Sending healing thoughts Ed's way. I hope the news is good. I'm glad you got to the retreat. Your flimsy is stunning! Beautiful colours! 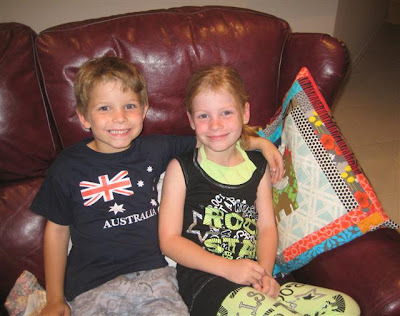 Happy 6th Birthday to Byron and Heidi!!! Well wishes are winging their way to you both. Hugs & prayers going out to you. Hoping it is good news. Love your quilt & of course the fabrics. Thoughts and prayers to you and yours, especially for your husband's health. What sweet, beautiful grandchildren, and I adore your new creation. How feminine and spring-like! Scrumptious colors! Oh Lurline, I wanted you to know I'm thinking of you often. I absolutely love your happy quilt and your adorable twins. Happy special day to the grandtwins! :) Good health to your husband my friend and steadfast strength to you and your close support group. All my love, friend. *karendianne. Your dh is in my prayers and I wish that you get some good news. Your quilt is just gorgeous! Thinking of you & your family...hope all is well. I love this quilt Lurline. Soft and pretty... take good thoughts with you tonight. Hey the pics are just lovely. I love the soft colors and low contrast in this quilt top. It is beautiful--for me it says "serenity".